When viewed in retrospect, Jackie Robinson's achievements (both on and off the field) are monumental in both their scope and significance to "America's Game," as well as our society as a whole. When Branch Rickey first met with Jackie about joining the Dodgers, he told him that for three years he would have to turn the other cheek and silently suffer all the vile things that would come his way. It wasn't Jackie's nature to do that. He was a fighter...a man who, as a lieutenant in the Army, risked a court-martial by refusing to sit in the back of a military bus. But when Rickey read to him from The Life of Christ, Jackie understood the wisdom and the necessity of forbearance; and somehow Jackie had the strength to suppress his instincts, to sacrifice his pride for his peoples’. It was an incredible act of selflessness that brought the races closer together than ever before and shaped the dreams of an entire generation. As the first African-American of the modern era to play in baseball's major leagues, Robinson thrilled fans and galvanized racial issues, by doing what he did best - playing amazing baseball. He was named Rookie of the Year and went on to appear in six World Series in ten seasons with the Dodgers (1947-56). Other major league teams soon followed Brooklyn's lead and hired black players of their own. 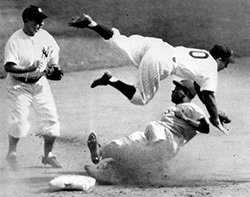 Robinson's stellar play, and his role in breaking the color barrier, led to his 1962 induction as the first African-American in baseball's Hall of Fame. Robinson retired on January 5, 1957. He had wanted to manage or coach in the major leagues, but received no offers. He became a vice-president for the Chock Full O' Nuts corporation instead, and served on the board of the NAACP until 1967, when he resigned. During the early to late 50's, Jackie and Louis Ostrer owned Jackie Robinson's, a men's clothing store located on 125th St. in New York City. He was inducted into the Baseball Hall of Fame in 1962, his first year of eligibility, becoming the first African-American so honored. On June 4, 1972 the Dodgers retired his uniform number 42 alongside Roy Campanella (39) and Sandy Koufax (32). Robinson made his final public appearance on October 14, 1972, before Game 2 of the World Series. He used this chance to express his wish for a black manager to be hired by a Major League Baseball team. This wish was granted two years later, following the 1974 season, when the Cleveland Indians gave their managerial post to Frank Robinson, a Hall of Fame bound slugger who was then still an active player, and no relation to Jackie Robinson. At the press conference announcing his hiring, Frank expressed his wish that Jackie had lived to see the moment. In 1973 Jackie’s wife Rachel started The Jackie Robinson Foundation (JRF) a not-for-profit national organization founded to perpetuate the memory of Jackie Robinson and his achievements. Serving as an advocate for young people with the greatest need, the Foundation assists increasing numbers of minority youths through the granting of four-year scholarships for higher education. The Jackie Robinson Foundation provides much more than financial support. While each Jackie Robinson Scholar receives up to $7,200 a year in financial support, they also become an active member in the Foundation's unique Education and Leadership Development Program, which is an extensive mentoring program that includes attendance at workshops, assignment of a peer and a professional mentor and placement into summer internships and permanent employment. 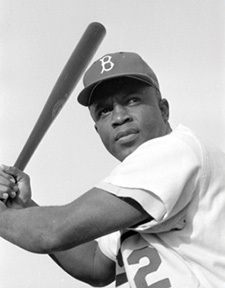 To contact the Jackie Robinson Foundation, please call (212) 290-8600 or visit our Web site at www.jackierobinson.org. In 1997, on the 50th anniversary of Robinson's first year with the Dodgers, Major League Baseball permanently retired Robinson's uniform number (42) on all professional baseball teams...something never done before or since. "Jackie Robinson was the predecessor. He paved the way for everybody of color to play the game," said Dodgers Center Fielder Milton Bradley, who had the honor of escorting Rachael Robinson, Jackie's widow, on to the field for the 2005 ceremony marking the 50th anniversary of the day that Robinson helped the Dodgers bring their only World Series title to Brooklyn. "He had the right frame of mind and the mentality, the guts to be the first. He was handpicked because he had the right demeanor to take all that abuse from fans and other players. I can't even imagine what he had to deal with." Willie Mays: Robinson was important to all blacks. To make it into the majors and to take all the name calling, he had to be something special. He had to take all this for years, not just for Jackie Robinson, but for the nation. Because all eyes were on Jackie at that particular time. Hank Aaron: I had just turned 20, and Jackie told me the only way to be successful at anything - whether it's baseball or life - was to go out and do it. He said baseball was a game you played every day, not once a week." Mickey Mantle: "After the game, Jackie Robinson came into our clubhouse and shook my hand. He said, 'You're a helluva ballplayer and you've got a great future.' I thought that was a classy gesture. I became a Jackie Robinson fan on the spot. Here was a player who had without doubt suffered more abuse and more taunts and more hatred than any player in the history of the game. And he had made a special effort to compliment and encourage a young white kid from Oklahoma." Frank Robinson: "If I had one wish in the world today, it would be that Jackie Robinson could be here to see this happen." - 1974 press conference on being the first black manager.